Syma - 3 Channel Radio Controlled Infrared Remote Controlled Electric RC Micro Mini Helicopter w/ Gyro by TOY WONDERS INC.
S107 Syma - 3 Channel Radio Controlled Infrared Remote Controlled Electric RC Micro Mini Helicopter w/ Gyro + Colorful Strobing LED Lights. This S107 equipped with NEW Gyroscope System for simpliest controls and stabilities, NEW Metal Frame & Body for extra durabilities, NEW Awesome Look and Design, and Bright strobing muti-color LED headlights so you can enjoy flying in the dark. At only 7" long, it easily fits in the palm of your hand and is fully functional. This S107 even has the option to charge directly from computer's USB port (USB cable included) or transmitter which uses "AA" batteries! S107 is in RED & YELLOW colors. Each Helicopter is individually packed in a window box. Box size: 17.75"L x 3"W x 7.25"H.
— As of 05/21/2012 this product had 4 out of 5 stars from 730 reviews on Amazon.com. PROS: Lightweight, durable, two methods of charging. CONS: Not suitable for children under 14; repairs are difficult. This net habitat (almost like a Chinese lantern) encloses caterpillars, food and the setting for a caterpillar’s eventual metamorphosis. It requires mail-sent larvae. “The Butterfly Garden not only shows actual insect metamorphosis, but it does so in just three weeks' time. Many other animal habitats can take up to six months for any changes to occur. This makes it a perfect item for kids who have short attention spans and is an ideal science project for any classroom,” John White, marketing director of Insect Lore, told TDmonthly. — Fred Rosenberg of On the Park in Kingwood, Texas, named this as his No. 1 seller in May 2008, with sales of 50 to 60 units monthly. “I just can't keep them in stock right now,” he told TDmonthly. “We have a display on our counter with the real butterflies so people can see it go through the process,” said Kim Emigh, VP of e-commerce at Growing Tree Toys in State College, Pa.
— 25% of 64 retailers surveyed in August 2008 named this as their top-selling nature toy, reporting average sales of 12 per month. Five of 38 retailers named Insect Lore’s butterfly habitats as best-selling science and nature products in late summer 2009. In an August 2010 survey, 21 percent of 43 specialty retailers said Insect Lore is a top-selling science and nature brand. Five retailers specifically cited Butterfly Garden as a best seller. 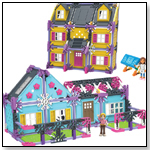 — As of 5/21/2012, the Butterfly Garden had spent more than 1,600 days in the top-100 best-selling toys and games at Amazon.com and has 4.4 out of 5 stars from 461 reviews. The walled fortress of Helm's Deep is under attack by the mighty Uruk-hai army and the forces of men, elves, and a dwarf must do everything they can to stop them from breaching the fortress walls. Includes 8 minifigures: Aragorn, Gimli, Haldir, King Théoden, Berserker Uruk-hai and 3 Uruk-hai.1368 pieces. Launch date: June 2012. This three-position adjustable, removable canopy protects baby from the sun and folds for storage just like the Baby Spring Float. There is a mesh play space for toys and splashing. Dual inflation chambers and low seat enhance security; the included sun canopy blocks 90% harmful UV rays. Features a "rainy day ducky" design and includes a carry/storage bag. 34"L x 30"W x 3"H. 1.64 lbs. Ages 9 to 24 months. — As of 05/21/2012 this product had 4.5 out of 5 stars from 199 reviews on Amazon.com. 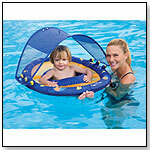 Pros: Thorough sun protection; folds up easily; the mesh area for toys is convenient. Cons: One customer complained of a leak around the hole where you inflate the float; One customer said her baby flipped over and was held under water because her legs were still in the hole. Little Tikes TotSports T-Ball Set by LITTLE TIKES INC.
Other products from LITTLE TIKES INC.
Beginning T-ball set includes an easy-to-use oversize bat, 2 oversize baseballs and Tee. 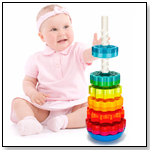 Adjustable height “T” adapts to a child’s developing skills. Special “hang-on-the-wall” design for easy small-space storage. Helps improve batting skills, motor skills and coordination. 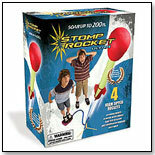 — As of 05/12/2011 this product was #1 in the Toy Sports category on Amazon.com and had 4.5 out of 5 stars from 50 reviews. Cons: One reviewer said that though the minimum age is listed at 2 years, her two year old had trouble with it; the base isn't very heavy so on the grass it's not very steady; the height only adjusts by about an inch. TotSports Easy Score Basketball Set by LITTLE TIKES INC. 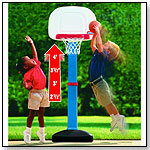 This adjustable basketball set features an oversized rim and junior size basketball. Baskets are easier to make, encouraging more active, winning play. — As of 05/20/2011, this product had 4.3 out of 5 stars from 103 reviews on Amazon.com, and was listed No. 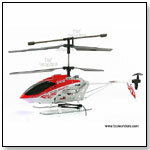 22 in the top 100 best-selling toys and games. PROS: Adjustable, durable and "addicting" for kids. Appeals to a wide age range. CONS: Board can bend forward. 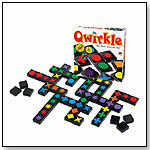 — “Winkels from Manhattan Toy — [we sell] about 30 per month,” Burdette told TDmonthly in March 2008. Five percent of the 40 retailers who spoke with TDmonthly in spring 2008 singled out this item as their stores’ best-selling infant and toddler toy. — "I sell 18 or so a month," Mary Ellen Cerney, owner of Dear Friends & Children in Duncan, Okla., said in March 2009. In June 2009, four of 47 retailers listed Manhattan Toy as their best-selling baby line. In March 2010, two of 39 specialty retailers cited Winkel as a best-selling baby toy. 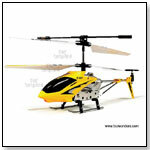 — In June 2010, five percent of 40 specialty retailers named Manhattan Toy’s Winkel as a top-selling baby product. — As of 05/21/2012 this product had 4.5 out of 5 stars from 299 reviews on Amazon.com. From the Hunger Games movie of 2012. 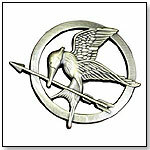 The mocking Jay pin replica as worn by Katniss in the Games. Measuring about 1.5" in diameter. — As of 05/21/2012 this product had 4.6 out of 5 stars from 102 reviews on Amazon.com. Monster High Rochelle Goyle Doll by MATTEL INC. 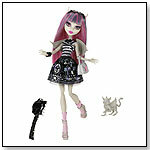 The Monster High student body continues to grrr-ow with four new ghouls enrolling this year. Like her fellow classmates, the Parisian-inspired Rochelle Goyle doll has a signature style with lots of scary cool details and an ancient monster heritage. Rochelle Goyle is the daughter of the infamous Gargoyles. Rochelle would also be lost without her best friend and sidekick, Roux, a lovable and loyal gargoyle griffin. Because she’s shy, she can sometimes seem like she has a chip on her shoulder, but she’s actually a loyal friend with a rock-solid fashion sense. She wears a black-and-white outfit with silvery accents and bold accessories and comes with her gargoyle griffin named, Roux, diary, doll stand, and brush. Launch date: 2012. 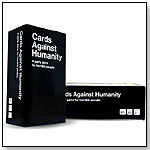 ― As of 5/24/2012 this product had 4.5 out of 5 stars from 19 reviews on Amazon.com.